Oh my dears, if you haven’t had moussaka in your life before, what the hell is wrong with you?? To be fair, my first moussaka was an Innocent Veg Pot version a few months back. And it was yum, but I wasn’t freaking out over it. Then a month or so ago N and I were down and out and having a weekend treat (ie BINGE) on takeaway from Meza (obviously). We decided to try their version of moussaka and oh my sweet baby Jesus was it good. Then we hit our stride as weekday vegetarians and, guess what? 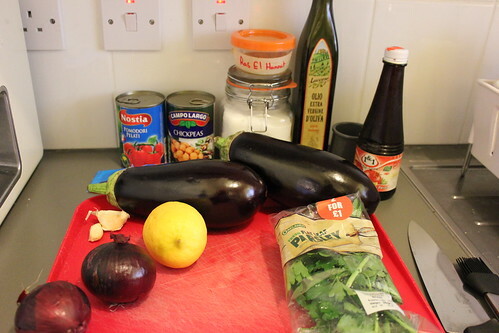 We’ve got an awesome moussaka recipe in our repertoire. My moussaka is based on the brilliant version over on Messy Vegetarian Cook (a brilliant site all around!) but, ever experimental, I’ve changed a few bits. We loved this particular version because it was portioned perfectly for two people. Bear that in mind if you do make it! I’m a big believer in being organised in the kitchen so I always get everything together before I do anything. Seriously. I’m probably slightly OCD but I’ve had too many ‘oh-my-god-we-forgot-the’ moments when about to commence cookery. At least before I get to chopping I know something’s missing. First, preheat your oven to 250C. 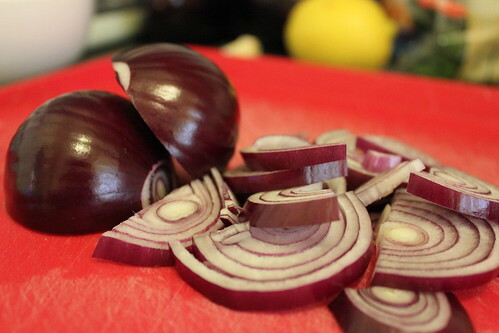 Slice your onions into half moons and pop them into a pre-heated pot with a lug of olive oil. Allow to fry until nice and soft and gooey. While your onions are frying off, slice up your aubergine. You can do it pretty much however you like–I’ve cut them into both rounds and slices (lengthwise) and either works well. What’s important is that you make them somewhat thick so that they don’t burn to a crisp in the oven. 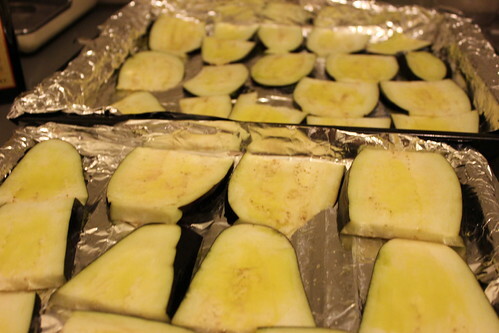 After you’ve sliced up your aubergine, lay the slices out on trays and lightly brush olive oil on both sides. Pop into the oven for about 8 minutes on each side. Keep an eye on them–once they start to go crispy/burnt they go quickly. While the aubergines are roasting, return to your onion and check its softness. When you’re nearly done frying, add in a tsp (plus a dash–I’m so technical) of Ras el Hanout. More on this gorgeous blend of spices here, if you’re interested. Dry fry for a few seconds and add your crushed garlic. Saute and stir continuously for around 30 seconds. 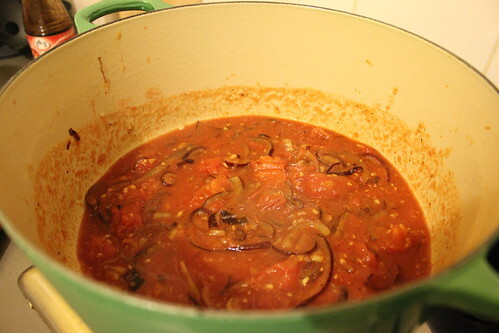 Next, add in your can of tomatoes, tomato paste, salt, sugar and lemon juice. Allow to bubble away for 5 minutes while you’re busy rescuing the aubergines from the oven. 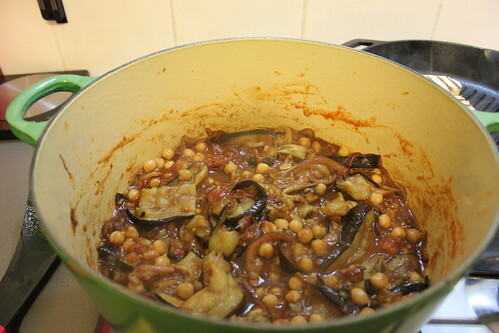 When the sauce has had at least 5 minutes and the aubergines are done, toss them in with the chickpeas and stir in your pomegranate molasses. The pomegranate will really change both the colour and the flavour, so don’t be shocked when your stew goes a brownish, purplish colour! Allow to simmer for 10 to 15 minutes on a low heat. Keep an eye on the stew and stir occasionally to keep from anything sticking to the bottom of the pan. If absolutely necessary, add a pinch of water to loosen. Add in the parsley for the last few minutes or keep to the side for garnish after dished out. Serve, enjoy and try not to feel too smug about how amazing this moussaka tastes. Again, a massive shout out to Messy Vegetarian Cook for providing me with a base recipe to jazz up to my own tastes. 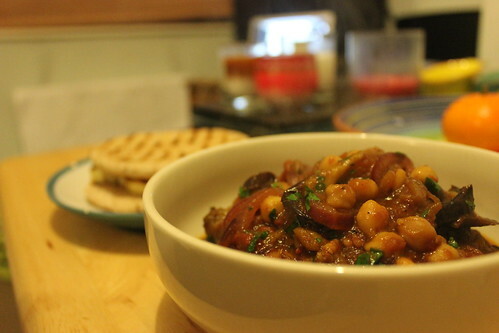 I’ll be honest, the first time I made this I followed the MVC recipe to the letter and it was amazing so if you’re a bit timid with exploration or can’t get your hands on Ras el Hanout, it’s a brilliant version and just as yummy! Share some of your veggie recipes! N and I are still weekday vegetarians (I know, right?) and we’re looking for new things to try.